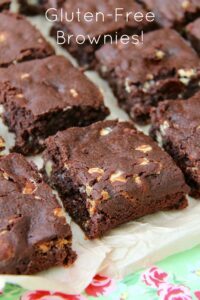 Delicious moist, chocolatey, and scrumptious Gluten-Free Brownies packed full of Chocolate Chips & Nuts. Heaven. You won’t even realise they are Gluten Free! 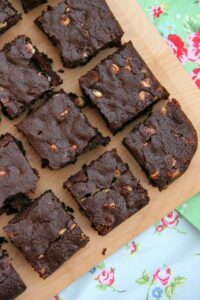 I find that sometimes bakes being gluten free can make them denser and off putting – but with this recipe and it being a brownie its not a problem as its gooey and that is how they are served best! 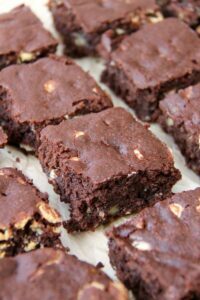 These brownies are made using ground almonds – a classic GF alternative, and these are exceptional. I often used to bake these before I found out I am Gluten Intolerant, and now I bake them near enough weekly! 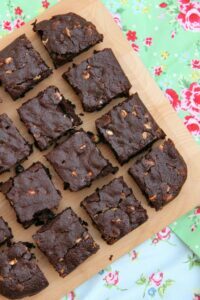 I love the combination of nuts & chocolate chips in my brownies, but my boyfriend for example, being the fuss pot he is, can sometimes hate the nuts… but he doesn’t moan with these! He can’t even tell it uses nuts! (score!). You can use combinations of different chocolate chips, or different nuts if you like – but I love what I have written in my recipe. To me, this recipe is utterly fool-proof and it always goes down well with my taste testers! 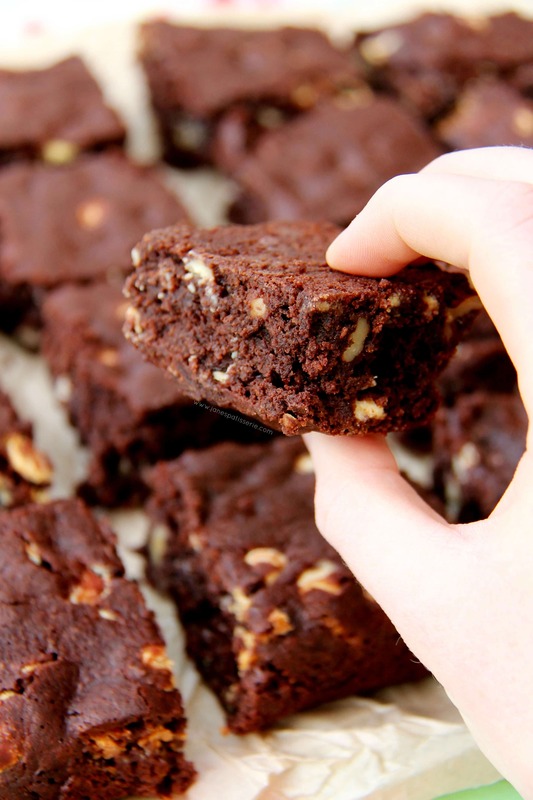 I already have a couple of Gluten-Free recipes on my blog, such as my Gluten Free Double Chocolate Cookies, and these have always been a massive hit. They are chocolatey, gooey, and of course – gluten free! 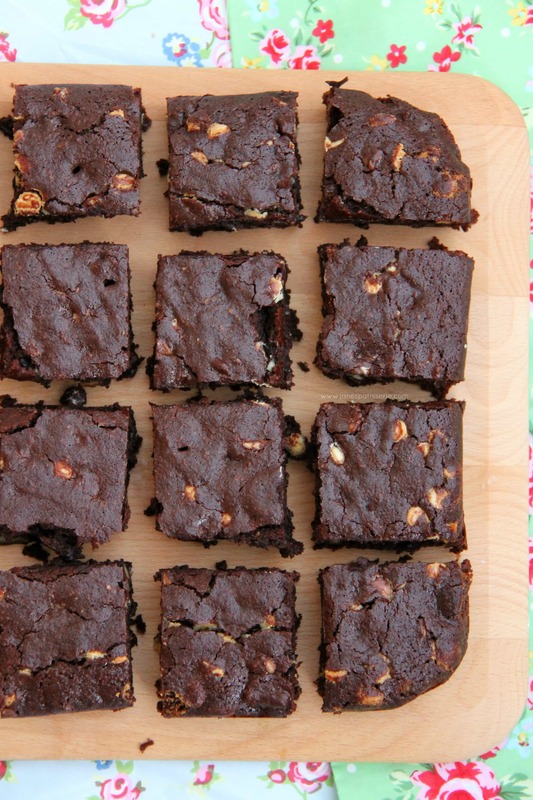 However… Brownies are my absolute weakness – this is demonstrated by all of my other Brownie & Blondie recipes already on my blog. My favourites are my Chocolate Orange Brownies, but theeeese brownies… these Gluten-Free brownies are just as good. And, all you Coeliacs out there can enjoy them too! I love this recipe, and have made it countless times – so I hope you all like them too! 2) Melt the butter and chocolate together in a bowl over a pan of simmering water (bain-marie) until it is silky smooth, stir occasionally – take the bowl off the heat and stir in the sugar, leave to cool for 10 minutes. 3) Once the mixture has cooled, whisk in the eggs until well combined – Stir in the Vanilla, cocoa powder, baking powder and ground almonds until combined and then carefully stir in the chocolate chips and pecan nuts. 4) Pour the mixture into the tin and bake in the oven for 30 minutes until a lovely crust has formed on top and they are cooked through in the middle, I test this with a cake tester! Leave to cool fully in the tin. 5) Once cooled, cut into individual squares and serve – I often serve mine with some vanilla ice cream to make it a super delicious dessert. If you are Gluten-Free I am sure you already know this, but double check that the baking powder is gluten free – most are but its always better to be safe! You can swap out the pecans for other nuts you like such as walnuts for example, but I love the taste of the pecans with the white chocolate – it makes a great combination. I have only ever baked these with Ground Almonds and have never tested them using GF flour, or alternative Nut flours – but feel free to experiment for me! 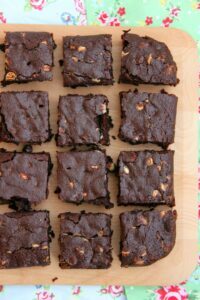 These Brownies will last for 3 days in an airtight container. Find my other Gluten-Free & Brownie Recipes on my Recipes Page! Older Next post: Peppermint Fudge! Newer Previous post: Christmas Tree Chocolate Brownies!